Girl Scouts has a long history of getting girls outside. But girls in the United States today are getting outside less as girls’ engagement with electronic devices grows. After a national study of nearly 3,000 fourth- to eighth-grade Girl Scouts, More than S’mores, a comprehensive report on the impact of Girl Scouts’ outdoor experiences, was published. The study of nearly 2,000 Girl Scout alumnae revealed that 49 percent described “camping trips” as one of the most positive aspects of their Girl Scout experience—ranking it just behind “fun” and “friendships with Girl Scouts.” Alumnae also said that “exposure to nature” was one of the foremost benefits of belonging to Girl Scouts (GSRI, 2012a). 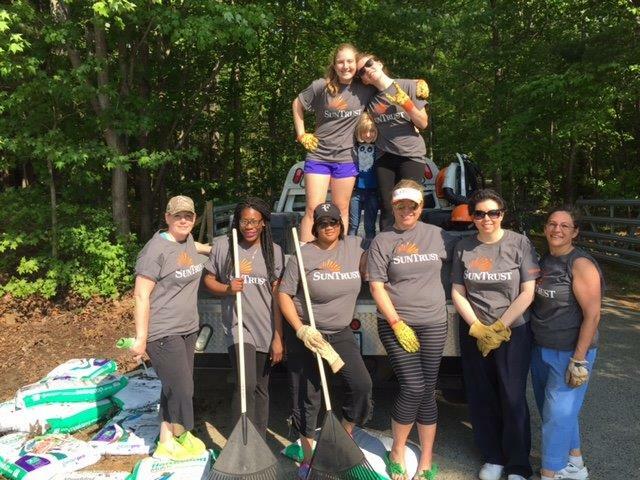 Members of SunTrust Bank’s Greater Washington Maryland Women’s Network Team spent time at Camp Woodlands sprucing up the area in preparation for summer camping activities. Outdoor spaces support physical play. Unlike most indoor environments, the outdoors offers open space where children are able to be messy, make noise, and move in more physically intense ways. This allows them to develop their movement capability and confidence—both of which create foundations for physically active lifestyles and general health. Time in nature promotes attention restoration. Spending time in nature (even just a walk in a park) has been shown to improve concentration and creative reasoning among children and adults, including those with attention deficits. Nature provides novelty and challenge, which enhance leadership. Outdoor experiences often place girls in new physical, psychological, and social situations that motivate curiosity andfoster a sense of discovery. Authentic challenges in nature (think . . . starting a fire in the rain or negotiating a set of whitewater rapids) require girls to become more self-aware and to cooperate,communicate, and solve problems more effectively. You can make a difference in a girl’s life today by making camp available to her. To find out more, email funddevelopment@gscm.org.